More blocks from sneek peekers are giving me the feeling this could be another popular block. 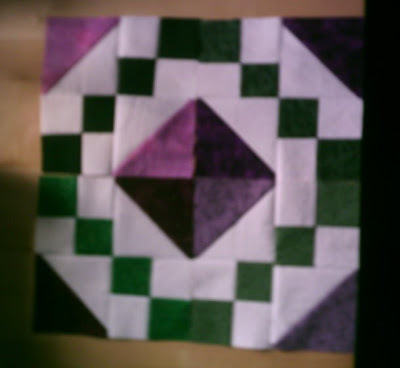 Sara made these eight blocks (arranged as purple path and green path blocks). And Rho made these four pairs. Before we officially begin the month, we already have 36 pairs – 72 blocks!! wow – they all look great – and no way am I donating my chances this month – in fact, I might even try to get that basket top put together so I get an extra chance, lol.